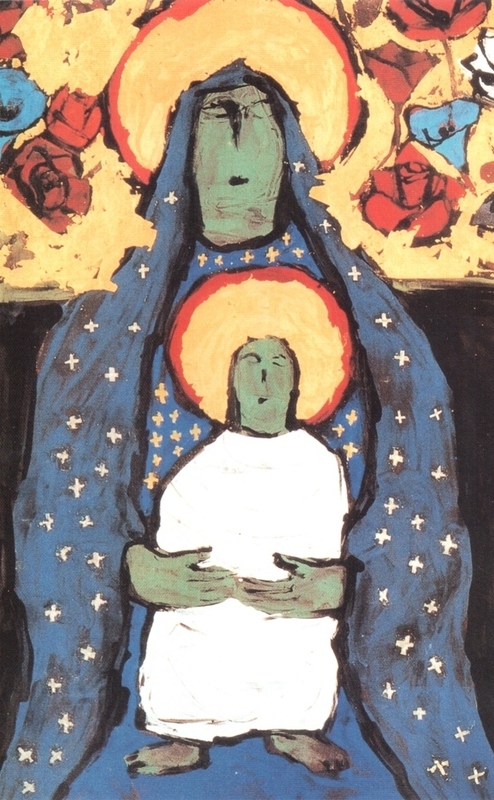 The Madonna in Blue is a favourite work by Yasuo Ueno, one of Japan's fore­most artists. The colours and composition are well balanced and the painting is pleasant to look at, which I believe is one of the most impor­tant points in any artistic work. Ueno’s work is in flat delineation, which could be said to be oriental. He uses only traditional Japanese paints which are sold as powders of minerals: blue powder of indigo copper ore, green of peacock stone and white of smashed shells. ‘I am fascinated,’ Ueno says, ‘by the beauty of Japanese paints, which I believe to be the most beautiful in the world. To express the glory of God and the space of infinity I use gold leaf as background colouring, mixing gelatine glue with mineral powder for the silk canvas.’ Throughout this process the artist adopts the primi­tive technique of using his fingers only. The artist' s philosophy of life can be understood by studying the faces of Mary and Jesus. The infant Jesus is held by a mother whose build is sturdy and whose strong feet are firmly planted. Mother and child have identical faces, reflecting the fact that both are the vis­ible face of the one God. Mary's blue gown is studded with stars, reminding us of the universe where God reigns. On close inspection the stars are small crosses, portents of the future path that in his adult life the Christ-child will follow. 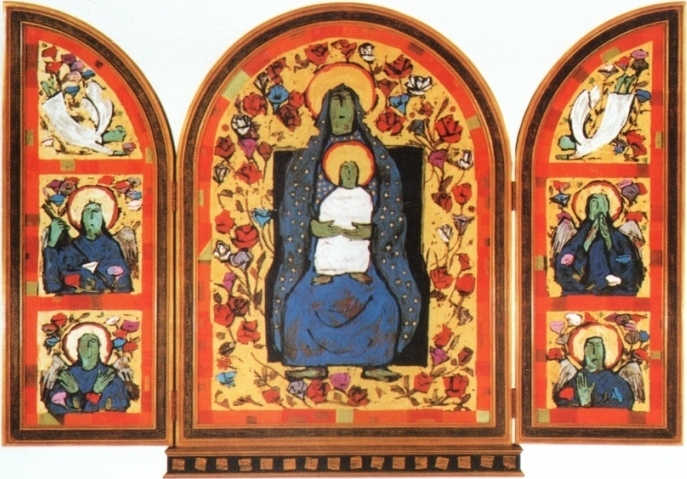 Yasuo Ueno: The Madonna in Blue, Japanese paints, gold leaf on silk canvas, 130 x 194 cm, 1997. Yasuo Ueno (1926-2005) is Emeritus Professor of Tamma Art College in Tokyo. He is a former President of the Asian Christian Art Association in Japan (CAAJ). Yasuo Ueno was born in 1926 in Tokyo. He graduated from the Tokyo Art School (Tokyo University of the Arts), he is a former member of SOGA-kai Association of Japanese painting, and a former member of Denenchofu Church. He passed away on August 11, 2005. His work is included in: M. Takenaka and Ron O’Grady: The Bible through Asian Eyes, ACAA & Pace Publishing – Auckland, New Zealand, 1991. This meditation is taken from Ron O’Grady (ed. ): Christ for All People, Celebrating a World of Christian Art, Asian Christian Art Organization, 2001.